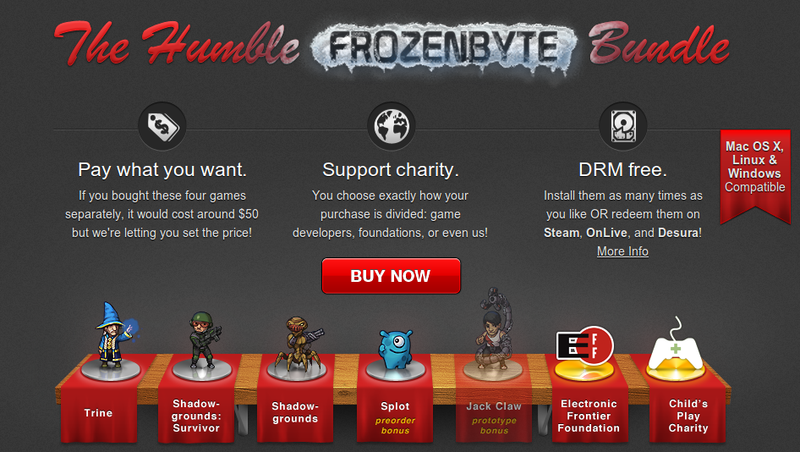 Humble Bundle Does it a Third Time, 5 Great Indie Games at 'Pay What You Want' Price! Humble Bundle is back with its collection of Indie games once again. 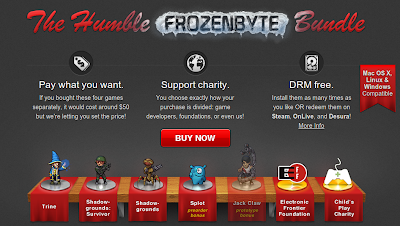 The latest Humble Frozenbyte Bundle comes with 5 indie games with the usual pay what you want offer which means, you can purchase the Humble Frozenbyte Bundle for the price you decide. Not only that, you can even choose exactly how your purchase is divided: Between Frozenbyte, the Electronic Frontier Foundation(EFF), or the Child's Play Charity. Games included in the list are Trine, Shadowgrounds, Shadowgrounds: Survivor, Splot and Jack Claw. While the first three listed above are very polished classic Indie games, the other two are different. Splot is still under development and will be added to your bundle once it is completed. Jack Claw is a prototype of a game Frozenbyte was developing but canceled before completion. Watch the video for more info. All of the games work great on Mac, Windows, and Linux and they are DRM free as well. So when you buy these games, they are yours and there will be no time-limit on your downloads. Similar to the pattern we saw during the last two Humble Bundles, Linux users rule the roost this time as well in terms of average purchase price which is more than twice the overall average purchase price. Great going Linuxers!